Last Week: Close. Saturday I doubt there was much at little sable, but pt betsie should’ve been good. Sunday Manistee was good and little sable point, but what was also good was that the wind ended up coming around in Muskegon to NNW, which I didn’t think it would. it came down mid morning and it doesn’t look like it’s picking back up. 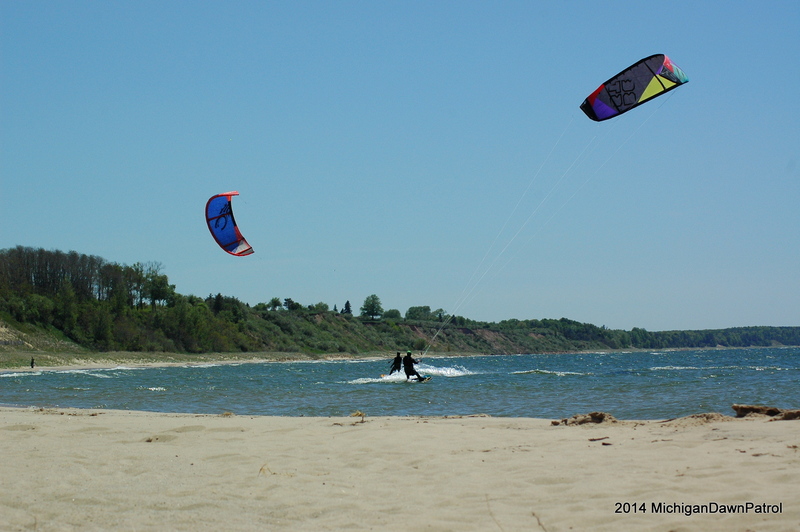 Saturday: Southerly flow, sunny, little sable and big sable points look like they’ll have enough wind to ride. 15 to 20 knots. Sunday: Again Sunday is looking like the windy day of the weekend. This time out of the south. It should be good the entire lakeshore with higher winds north of muskegon and at the points. Holland St Pk, N. Mkg St Pk, Medberry Park, Meinert Park, LSP, Ludington St Pk, Frankfort and Pt Betsie would be some good spots. One spoiler possibility would be rain and thunderstorms Sunday. You will need to keep and eye on that and watch the timing. Right now they are saying later in the day Sunday. I won’t be able to check in and comment this weekend if things look like they are changing, but I’m still hoping to get out Sunday. Not sure where yet though. Southeast winds all along the lakeshore this morning as well. The forecast doesn’t show the wind switching to south until late in the day when thunder showers are supposed to roll in. I still think it is worth checking out areas south of LSP(Meinert, Claybanks, Whitehall/Montague) in a few hours if it looks like the wind is shifting more south. If it stays easterly then the west side of the Traverse Bays or Muskegon Lake are looking like the only options. Well it shifted south enough to ride from Muskegon to LSP but was gusty and shifting offshore.